Learning how to hold an acoustic guitar properly will be one of the most important things for ensuring that you learn with good technique. So you’d think that this is one of the first things that people learn, right? Unfortunately, and I am one of them, a lot of guitarists start out learning the instrument without learning some crucial techniques – like holding the guitar and left and right hand positioning. This is the folly of being “self-taught” – and it’s understandable – I mean who would even think about the finer points of holding a guitar – surely I can just hold it any which way? it’s my fingers that are the only important thing right? To hold your guitar properly you need to set your body in the right position and have the guitar in the right position. There are a few different things to keep in mind and I’ll outline them below. This post will only look at holding the guitar sitting down. This is because you should be sitting when you are first learning the guitar, it makes it easier to learn. If you start playing on stage or in a group you might want to learn to play standing up – but this comes later. O.k. let’s get into it. Having the right seat is the first step. Firstly you need to get a seat or stool with no arm rests on it. They will get in the way of the guitar. Secondly your seat shouldn’t be too soft or slouchy – sorry guys no couch playing! At least not yet. Playing on a couch was another bad habit that I got into – trust me it’s not good for your technique so find yourself a comfortable but not too soft seat. The height of the chair should be so that you can comfortably rest your feet flat on the floor. 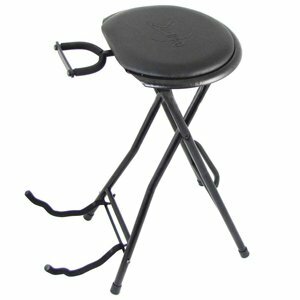 You can get guitar stools from a music store and they are probably ideal. They’ll be at the ideal height and don’t have arms and aren’t too slouchy. But they can also be pricey for what they are. So if you’ve got the cash to spend then you could go this way – or you could find something else suitable that you already have or for cheaper. Whilst it may seem like a small thing, the chair you sit in and how you sit in it, is an important foundation for how you hold the guitar. If you are sitting on a chair with a back on it don’t use the back to lean on. I know I know – no couches, no backs! But trust me here. And you’ll get used to it and it will help your technique down the road and it’s a great habit to form now. Sit with your back straight and sit on the front edge of your seat or stool. This can be difficult to keep up for too long for a lot of people who, like me, may not be used to sitting like this. But, like I’ve said in several other posts – it is much better to practice properly for 10 minutes than it is to practice poorly for an hour. So build up your time slowly and you’ll get used to it. You want to build up your time slowly for many other reasons too. I always recommend that beginners, and guitarists just getting back into guitar, don’t spend more than 15 minutes per day to begin with. If you want to be spending longer than that then build up the time slowly – learn more about practicing techniques like this here. The easiest way to learn guitar is with your guitar on your left leg (if you are right handed or right leg if you are left handed). The reason for this is that it’s just easier to do it this way. One of the big advantages is that the lower bout of the guitar can rest on your right leg which helps to keep it stable. This is the classical position. It doesn’t look as cool I know. But it’s the best way to start at least. Later on, maybe you can move to the right which is more casual but I’d suggest starting out on the left. Whether you are playing on your right or left leg, your guitar should be tight into your body. It’s harder to play if you are playing away from your body. You will get better access to the fingerboard if you angle the headstock towards the ceiling. What I mean by this is, that if you angle the guitar so that the headstock is higher up than the body of the guitar, then you it will be easier to play with good technique. This is opposed to being parallel to the floor. Using a foot stool is an easy way to make sure you get this angle. Don’t be tempted to tilt the fingerboard back so that you can see the frets better. The fingerboard should be vertical. One important reason for holding the guitar correctly is that you shouldn’t have to do much holding with your fretting hand (left hand for right-handers and right hand for left-handers). If you have to hold the neck in position with your fretting hand, then you aren’t going to have your fretting hand in the best position. So holding the guitar and sitting as described in the first few steps, will ensure that you aren’t having to hold the guitar in position with your fretting hand. 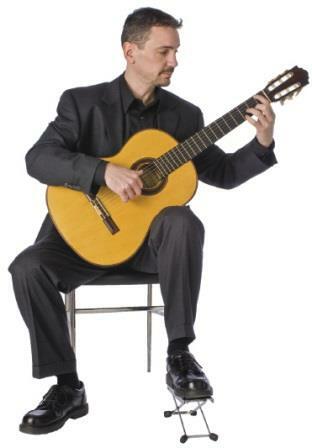 But you still need to do some holding – even though your body position and guitar position now should be pretty stable. To hold the guitar simply tuck it under your elbow. If you are set up properly otherwise, this should be all you need to keep the guitar stable and in position. Your left arm should be relaxed with your elbow by your side. No chicken wings! This will be crucial for the proper fretting technique with your fretting hand. Learn more about the proper fretting technique at the link below. Thanks for reading and I hope this post has helped you to learn the proper way to hold an acoustic guitar to ensure the best technique. If you disagree with any of the tips here or have anything that I’ve missed please join in the conversation by leaving a comment in the comments section below. Any other comments or questions also very welcome, as always.